Intestinal bacteria causing bacterial dysentery, food poisoning, gastroenteritis, abdominal distension, acute and chronic appendicitis, tooth abscess, canker sores, strep throat, sinus infection. traveler's diarrhea are some of the imbalances satisfied clients have used this product for. 3 pills, 3 x day. 200 teapills per bottle. Coptis chinensis rhizome. - Huang Lian. 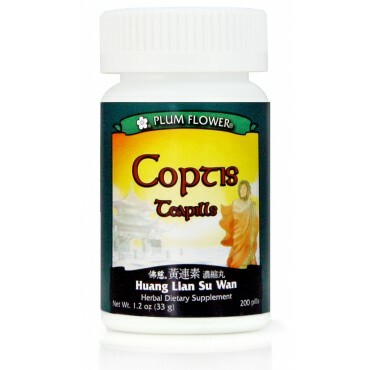 Huang Lian/coptis is a very cold herb and can injure the Spleen and Stomach when taken for too long or in excess amounts. Contraindicated for complaints due to excess cold or Qi deficiency.